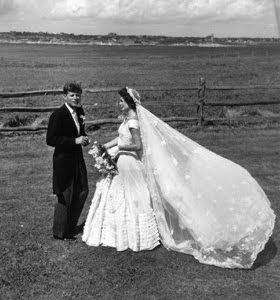 Jacqueline Lee Bouvier and John F. Kennedy were married on the morning of September 12, 1953, in the picturesque St. Mary’s Roman Catholic Church in Newport, Rhode Island. The more than eight hundred guests included many notable individuals. 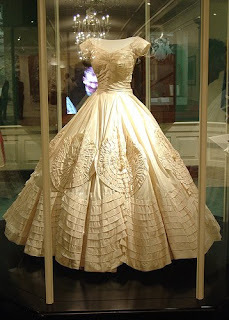 The bride, given in marriage by her stepfather, Hugh D. Auchincloss, wore a ivory silk wedding gown which required 50 yards of ivory silk taffeta and took more than two months to make. 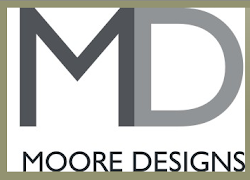 It was the creation of Ann Lowe, an African-American dress-maker born in Grayton, Alabama, who had designed gowns for the matrons of high society families including the du Pont, Lodge, and Auchincloss families. 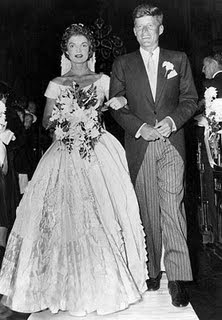 Ms. Lowe was 54 when she designed the Bouvier wedding dress, which featured a portrait neckline and bouffant skirt decorated with interwoven bands of tucking and tiny wax flowers. She also designed the pink faille silk gowns and matching Tudor caps worn by the bridal attendants. Her attendants, dressed in pink taffeta, included her sister, Lee, then Mrs. Michael T. Canfield, as matron of honor: her stepsister Nina G. Auchincloss as maid of honor: a bevy of ten bridesmaids, among them the groom’s sister Jean and sister-in-law Ethel, and the bride’s former boarding school roommate, Nancy Tuckerman. Half sister Janet Auchincloss was flower girl and half brother James Auchincloss served as a page. 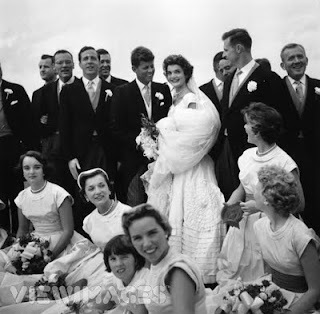 Senator Kennedy’s best man was his brother Robert and among the ushers were brother Edward Kennedy, brother-in-law Sargent Shriver, cousin Joe Gargan, brother-in-law Michael Canfield, Lem Billings, Red Fay, Torbert MacDonald, Senate colleague George Smathers, and Charles Bartlett, who had introduced the couple. The ceremony was performed by Archbishop Cushing, a friend of the Kennedy Family, and he was assisted by four other priests, including the former president of Notre Dame and the head of the Christopher Society. Before the mass, a special blessing from Pope Pius XII was read. Tenor soloist Luigi Vena from Boston sang Gounod’s Ave Maria. The reception was held on the huge terrace of the 300 acre Auchincloss oceanfront estate, Hammersmith Farm, for more than twelve hundred guests. The wedding cake, four feet tall, had been ordered by Joseph Kennedy. Meyer Davis and his orchestra played under a huge canopy. 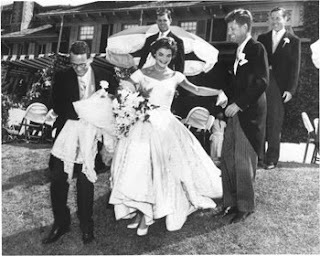 To celebrate the upcoming anniversary of the day she became a Kennedy (Sept. 12), LIFE presents rare outtakes from our famous coverage of JFK's stunning, stylish wife. 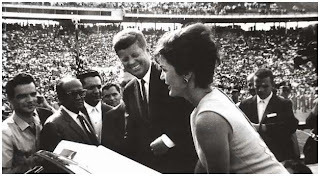 See photos of Jackie taken during the couple's 10 years together: on the campaign trail, and more. gave to him on the occasion of their first anniversary. "All this will not be finished in the first one hundred days. I have stood on the landing at Hammersmith Farm, the spot from which Jacqueline threw her bouquet. A magical place. It was easy to see all the wedding guests still celebrating out on the lawn. Fabulous post, as always. Love your enduring coverage of the Kennedys. 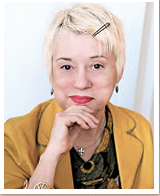 Jackie is my favorite woman ever; my favorite quote of hers goes something along the lines of, "If you bungle raising your children, nothing else much matters in life..." Did I read that here on your blog? 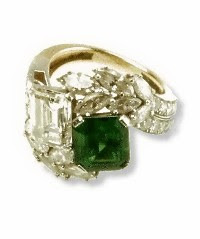 I adore that engagement ring -- I always love a ring that includes colored stones and that emerald is stunning. Hope you're having a great weekend, Deb! I wish I were in Newport right now, reading your post and looking at the beautiful photos of an area past, it gives me a powerful sense of how fleeting life is. 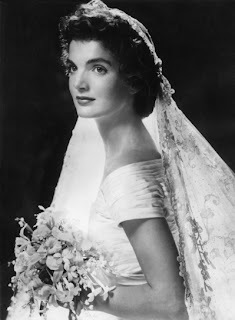 As a young french bride,I was introduced to Newport society where my husband's family summered in one of these wonderful summer cottages, I would always (and still) ride by Hammersmith farm with romantic notions of the past life of Jacqueline Kennedy.I still remember,as a child, being infatuated by her beauty, style and class. My favorite couple! Lovely post. 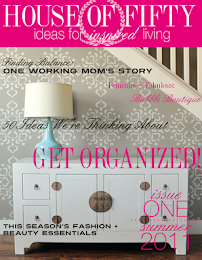 Great info. Love the photos. I really enjoyed this post. Hope you've had a nice weekend. What a gorgeous post, darling ~ love all these vintage pics, and that ring is stunning! I love that her dress was rather American and simple and 'beach side wedding' in reality, and her veil was very simple and pretty. She was such a natural-looking beauty at that time. A nice nostalgia trip--thank you. Wow what gorgeous pictures - I don't think I've ever seen them before. She was an exquisite bride! Pink taffeta bridesmaids dresses never looked so glamorous, did they? Such a remarkable / comprehensive post on the chicest of all the tres chic weddings Newport has ever seen. Having spent more than a little time down the street from Hammersmith Farm, at Beaulieu on Bellevue - I, too, always felt as if I were passing by a special place where real fairy tales happened. 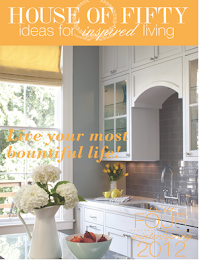 I could find your blog! Jackie was such an incredible lady. Thank you so much for this beautiful post. 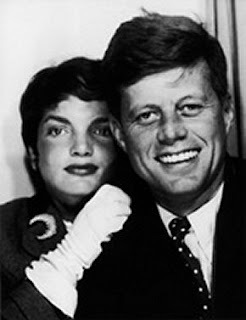 I've never seen the photo booth pic of John and Jackie. I love it! What a fantastic post. That was a beautiful dress. Its testament to her timeless style! A wonderful post. So hard to believe the brothers are all gone now too. 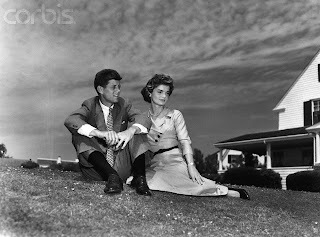 "Don't let it be forgot, that once there was a spot, for one brief shining moment that was known as Camelot." What a beautiful post and so many memories of the past. Happy ending was not... unfortunately. Lovely post. Thank you for this recap and the wonderful images. They were such a stunning couple and it still saddens me to think of what would later happen. I of course don't have access to the Life footage, but reading this was the next best think. Thanks for posting!